Sometime in our past, almost everyone of us fell for someone. A fleeting glance made someone crave, and a whiff of parfum mesmerized someone far away. Almost everyone fell. Like most of you, I must admit—I did. Some silhouette cast its shadows on the cobwebs of my mind. Wiping out the clutter and opening doors of varied perceptions. I was at my creative best. I acted, drew, sung, mixed, crooned, awed, dreamt. And I dreamt some more. Well, a few days ago, while fighting scorpions in my attic, I found something. Something that worked as a Time Machine. 'Coz it took me back to the time when any kingdom I ever dreamt of was ruled by me. A CD that was labeled XFiles2. I found an array of sound files, most of them mp3s. And then, I came across a snapshot of my life. One which I had captured in words and music. 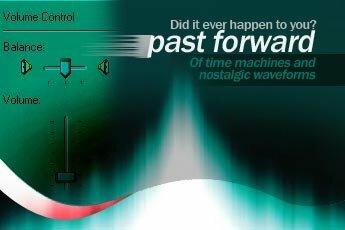 Did you ever travel back in the time machine? Trust me amit...This is all I've been singing since yesterday. You've done an awesome job. It's just beautiful. Everything....the tune ,lyrics and your voice.Keep up the good work and keep dreaming, dream big and make it a reality. Well, a few days ago, while fighting scorpions in my attic, I found something. Something that worked as a Time Machine. 'Coz it took me back to the time when any kingdom I ever dreamt of was ruled by me. The exact same thing happened to me when I was cleaning up my stuff now that I am moving to New Jersey. I was sifting through all the receipts all the college notes and just relived those days as memories came flooding back. That was a wonderful song. Nice mood and the way you pronounced certain words was very beautiful. Also I meant to tell you this earlier, but kept postponing it. The best feature of your blog apart from its design is the image you create that defines each post. Its obvious that a lot of time and thought goes into its making and they invariably capture the essence of each post aptly. Very creative indeed. Hey howz Angels n Demons ?!?! i cud only say in name of villain there is one anagram, which author has not explained but is it same u was telling ? I didnt know that you sing also...great stuff...the production of that song is terrific(U did it urself?! )...singing me bhi ek naya sa hai..nice to know that..hope oneday we can share more on music.. Thanks, Chetan. You really help me push my limits everytime! @Charul: Hmm... Did I tell you that there was a Bonus ambigram in DaVinciCode? Well, well, I actually meant that there was one in Angels and Demons. The inside cover Page Title is an Ambigram. No, not about teabing's name. That's the anagram in DaVinciCode. @Roy: Yeah, mahn. Actually, I had this sudden fervour to listen to Ustad Nusrat Fateh Ali Khan, when I was just out of 10th std or so. And I morphed into a great connoisseur of Sufi music. Many a times, I would try and imitate the Legend. And maybe then, a few modulations were infused in my vocal chords as well. Thanks for liking the production. Yes, *take a bow* I did it myself. Singing mein kya nayaa laga? Yeah, fella, we should Jam more. And yes, one day, let's talk about music! awesome! (5 starts) ***** to wht u have composed. Its sure gonna be the next big thing. @Mon: Thanks a lot. Fabulous Rating! Yeah that's a great feeling, and good to know that you travelled back recently. @Raj: Yes, please. Find a sponsor! @All: Your oorja had helped me concoct a Rap and it'll soon be live!